Publication Information: Scribner. 2018 (reprint edition). 256 pages. Opening Sentence: "The river was young and small." Favorite Quote: "Everyday, you choose." 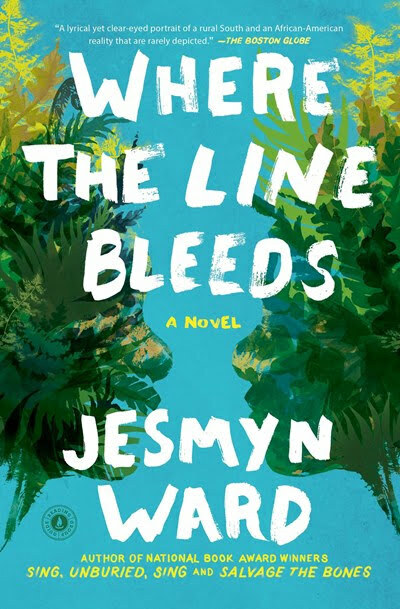 Where the Line Bleeds is actually Jesmyn Ward's first book. Initially published in 2008, the book is being reissued this year. My guess is the reissue stems from the success of Jesmyn Ward's later works, which have won countless awards including the National Book Award. The author Jesmyn Ward is also a recipient of the 2017 MacArthur Fellowship (aka the MacArthur Genius Grant) for "exploring the enduring bonds of community and familial love among poor African Americans of the rural South against a landscape of circumscribed possibilities and lost potential." Where The Line Bleeds brings the reader once again to the world of these communities of the South. This book is the story of two brothers. Twins Joshua and Cristophe DeLisle live in the fictional small, rural community of Bois Sauvage on the Mississippi Gulf Coast. They have lost their father to drug addiction; although he is still alive and still in the area, he is not a father to the boys. Their mother left them to the care of others and went off to the city to seek a different life. She does visit and provide some financial support but on her terms and at her convenience. The boys' anchor is their grandmother, who has raised them with love and discipline and a sense of right and wrong. The book opens as Joshua and Cristophe are about to graduate high school. College and a further education are beyond the realm of possibility. Leaving Bois Sauvage is not possible for the boys will not leave their grandmother. She has cared for them all their lives; it is now their responsibility to care for her. The only possibilities seem to be a handful of local jobs - the McDonald's, the Walmart, and the docks. Honest jobs for honest pay. The boys try, putting in applications everywhere they can think of. A cousin throws out one more possibility - drugs and drug dealing. It is presented as a short-term solution to earn quick money, achieve some stability, and then get out when a job presents itself. As days pass, Joshua gets an opportunity for a job at the docks. It is manual labor and long days, but there is an honest paycheck at the end of it. This job is cause for celebration and pride. He did it. He has a job. Unfortunately, Cristophe is not given the same opportunity, and a divide appears between the brothers. Cristophe chooses a different path for he has to earn money to help support his grandmother and keep up with his brother. As in her other books, Jesmyn Ward's writing submerges me completely into this small community, into the love, the poverty, and the desperation that fills the lives here. This book does not have the intensity of Men We Reaped and Sing Unburied Sing. It is a quieter story of the day to day realities of these communities. The unspoken and unwritten heart of this book is the unfathomable reality that these young men see these limited paths as their only choices. That sense of hopelessness and that lack of possibility is their reality. Part of me goes through the entire book with a lack of understanding. Why not dream bigger? Why choose this path? Why not college? Why not? The realization hits hard that this is the reality that Jesmyn Ward's books portray. The resources and the potential so many of us take for granted in the United States still are not open and available to all of the nation's citizens. Once again, Jesmyn Ward's writing communicates a powerful message.